Gooderstone Water Gardens01603 712913work GardenA unique attraction for all garden lovers, naturalists and photographers - or those who simply want a restful break. Billy Knights, a retired farmer with no training but great enthusiasm began his garden in 1970 according to his own taste; his likes and dislikes were not dictated by fashion. 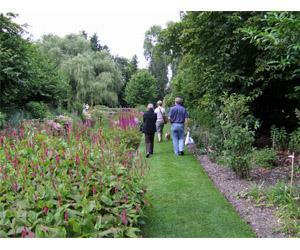 When he died aged 93 in 1994 he left behind an entrancing 6.5 acre garden that sits well in the Norfolk countryside. From the natural trout stream he created ponds and flowing waterways spanned by thirteen bridges. Combining the native and cultivated plants in informal beds his daughter Coral is endeavouring to further enhance this atmospheric garden. There are mature trees and shrubs, colourful bogs, plants and border perennials and flat grassy paths that lead visitors around corners to more lovely and unexpected views. A unique attraction for all garden lovers, naturalists and photographers - or those who simply want a restful break. Billy Knights, a retired farmer with no training but great enthusiasm began his garden in 1970 according to his own taste; his likes and dislikes were not dictated by fashion. When he died aged 93 in 1994 he left behind an entrancing 6.5 acre garden that sits well in the Norfolk countryside. What could be nicer than to stroll through an enchanting garden, explore the nature trail, perhaps spot a kingfisher and enjoy tea and yummy homemade cakes. Tearoom every day from 12th March to end October 2018 (if weather fair) to check please phone 01366328118/01366328007. Adults £6.25-£6.75, Children 16 and under Free. Groups 12+ £5.75.